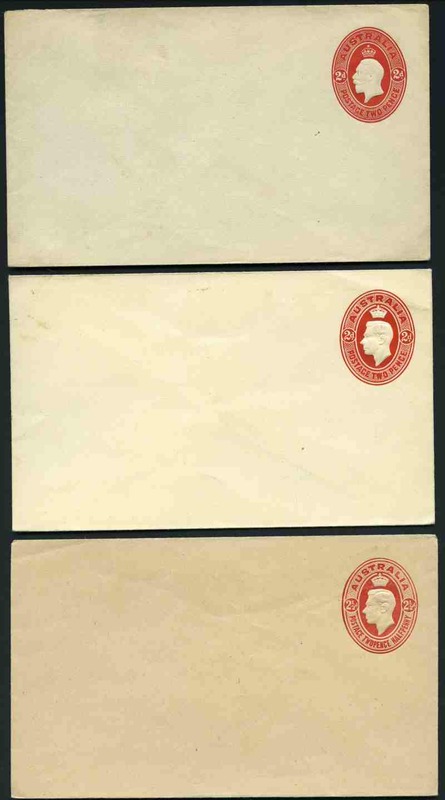 Collection of 468 mint and 389 cancelled FDI Pre-stamped envelopes from 1978 to 2009, including some duplicates and odd special cancel. Face Value $312.00. Accumulation of 2,268 PSE's cancelled FDI from 1978 to 2005, including many pictorial postmarks, sets and numerous duplicates. Face Value $727.00. Also range of Aerogrammes cancelled FDI. Accumulation of 1,338 mint PSE's from 1978 to 2003. 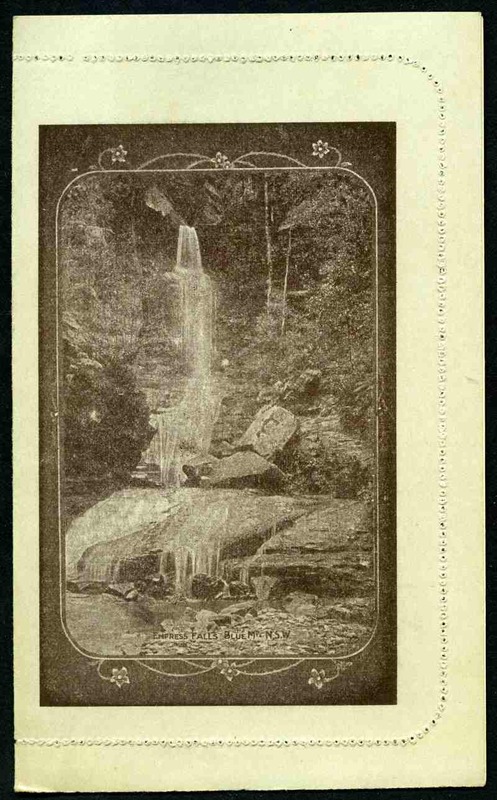 Mainly 20¢, 22¢, 24¢, 27¢, 30¢, 33¢ and 37¢ values. Also 353 mint Aerogrammes from 1979 to 2003. Face Value $547.00. Accumulation of 1,369 mint and 410 cancelled FDI PSE's from 1978 to 1986. Face Value $424.00. 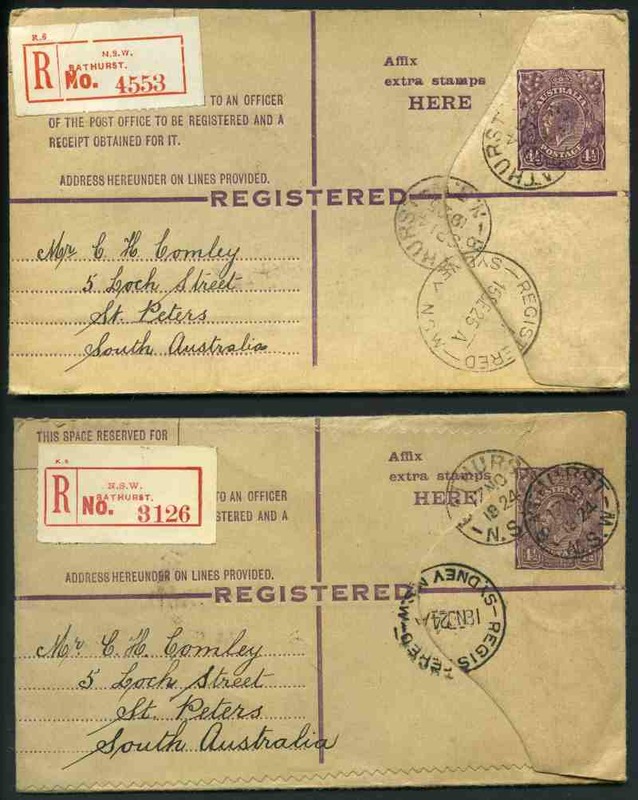 Also range of FDC's. Postal Stationary and miscellaneous items including 1976 Red (4), 1981 Brown and 1982 Black postcard packs and 1988 $10.00 Bicentennial note with 26th January 1988 O/P in folder Unc. 1923 "One Penny" overprint on obsolete 1½d Brown KGV issue without footnote at base unused. Crease at base and area of even discolouration. ACSC P58. Catalogue Value $750.00. 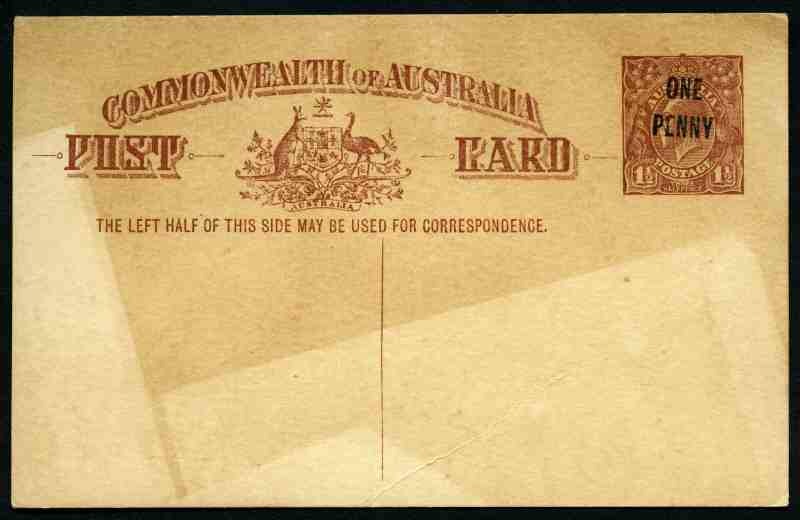 1923 "One Penny" overprint on obsolete 1½d Brown KGV issue without footnote at base unused. Crease at base. ACSC P58. Catalogue Value $750.00. 1976 Red (4), 1978 Blue (3), 1981 Brown (11), 1982 Black (12) and 1982 Natural Heritage (2) postcard packs. 4 packs without plastic covers. Face Value $292.08. 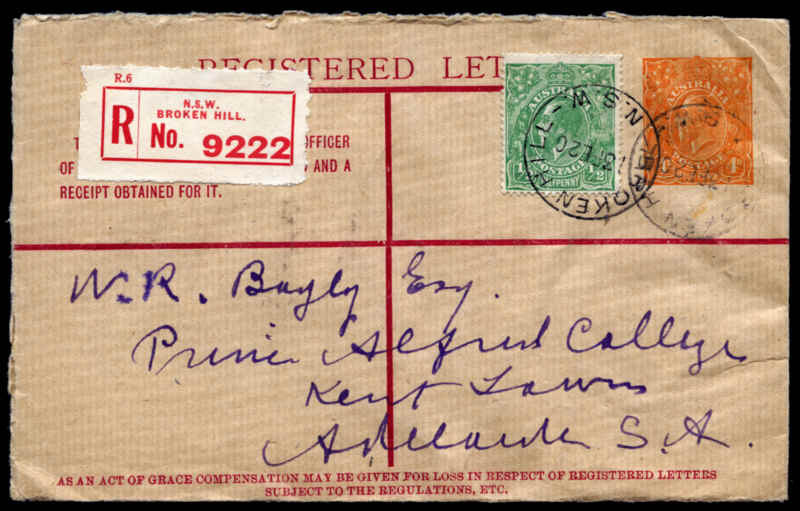 1919 4d Orange KGV Registered Envelope with new layout, having all text in Red, up rated to 4½d with ½d Green KGV and sent from Broken Hill to Kent Town. The specialist catalogue states that very few examples are recorded. ACSC RE9. A small crease barely detracts. Catalogue Value $1,500.00. 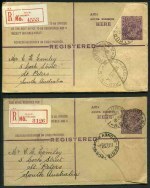 1924-25 4½d Violet KGV on De La Rue stock, with saw-tooth edges and correct spelling of envelope, 1924-25 4½d Violet KGV on Hodgson Wove stock with straight edges and top on crown and 1928-30 4½d KGV short envelope (few pinholes) with oval die fine used. ACSC RE18, 19 and 21. 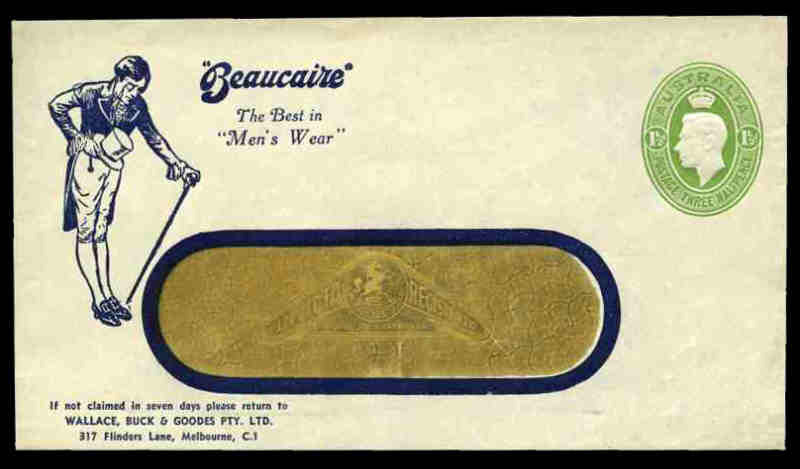 Catalogue Value $155.00. 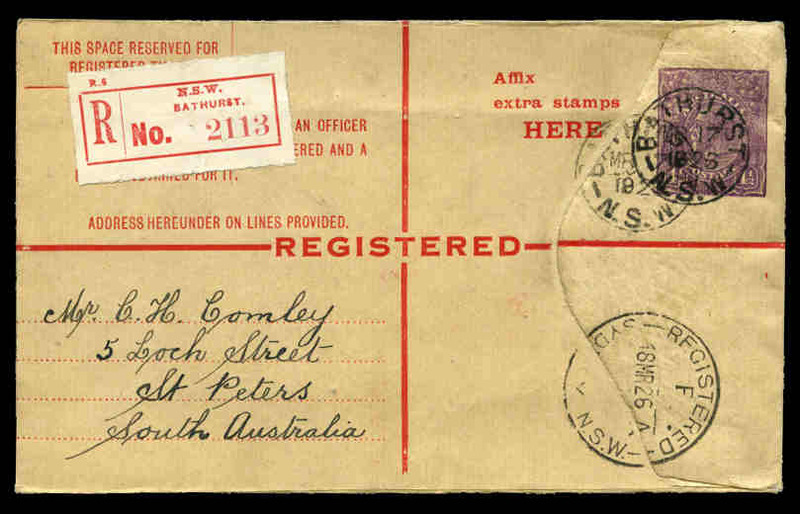 1925-1928 4½d Violet KGV Registered envelope with Red text, Linen lined flap and no top to crown, sent in March 1926 from Bathurst to St. Peters, South Australia. 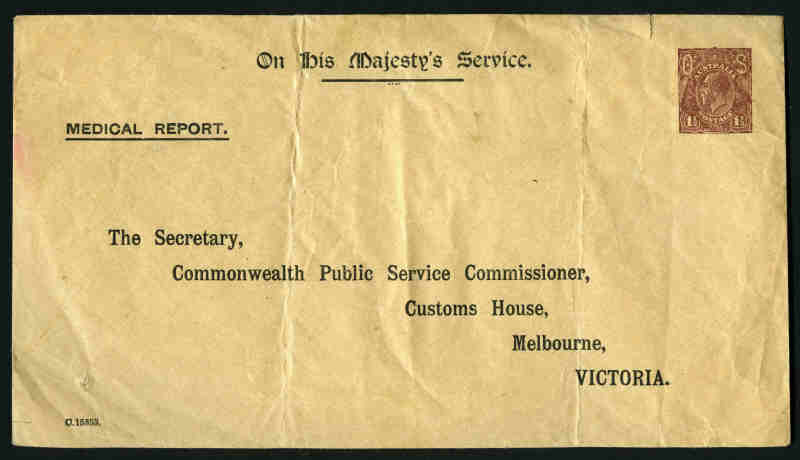 ACSC notes that no top to crown has not been noted with this flap type. ACSC RE20Ad. 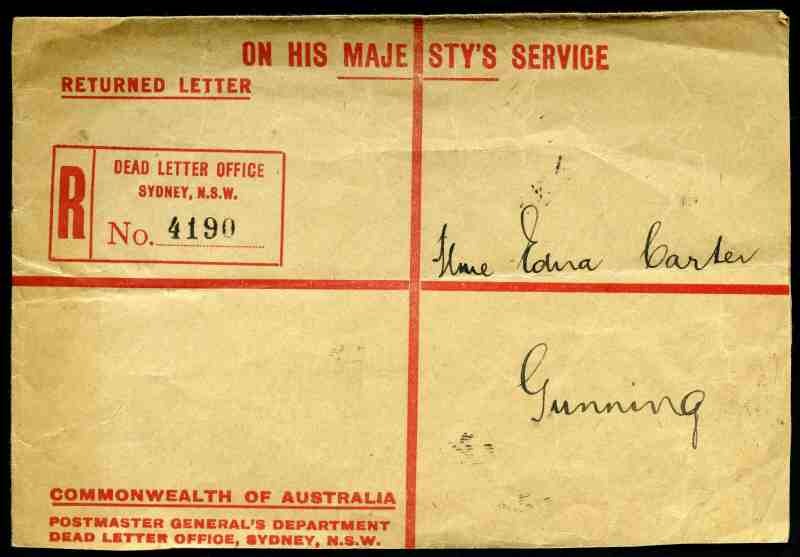 1933 "RETURNED LETTER" Registration Envelope with Dead Letter Office, Sydney NSW, Registration imprint at left, addressed to Gunning, NSW, with Gunning and other backstamps. Some light wrinkling as would be expected. 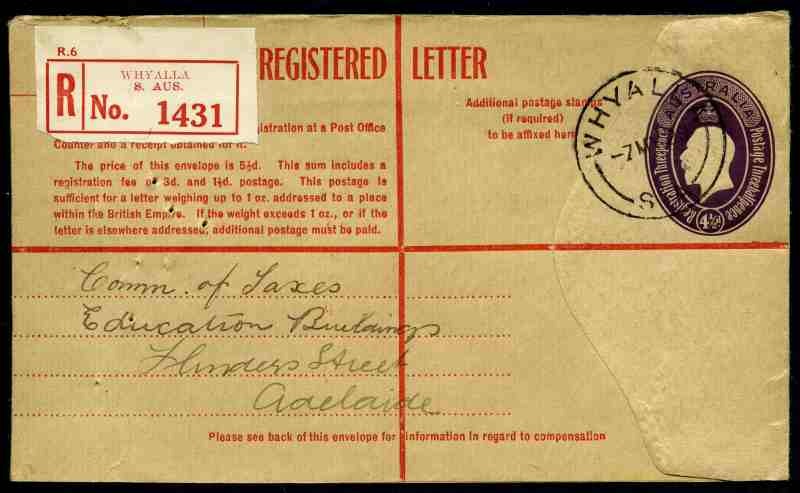 Accumulation of hundreds of First Day Covers, Pre-Stamped Envelopes, Aerogrammes, Replica cards and Lettercards with some special or commemorative postmarks from 1951 to 1993, including a range of Australian Antarctic Territory, New Zealand and Foreign. 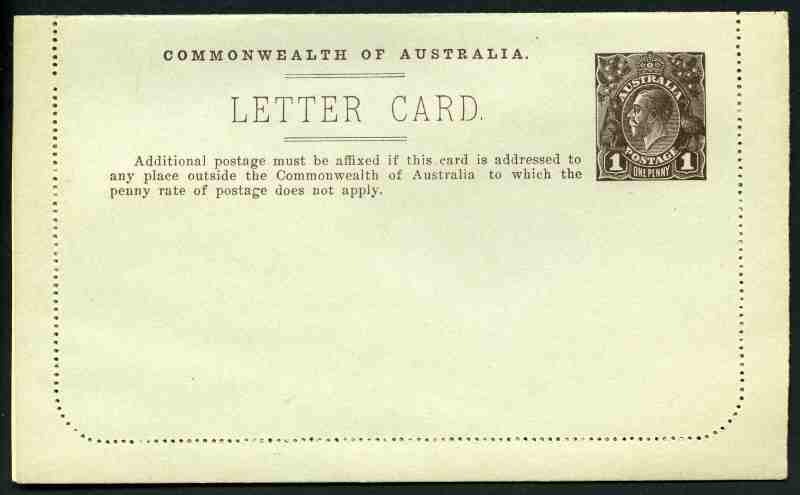 Noted 1966 Definitive set of 24 on typed addressed Australia Post logo covers. Odd minor blemish and varying duplication. Face value of official unaddressed FDC's, PSE's and Aerogrammes from 1974 onwards is $904.00. 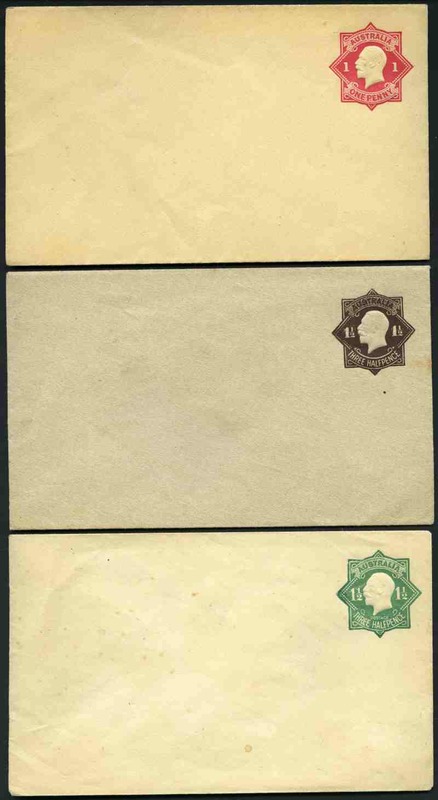 Accumulation of many thousands of mostly early Postal stationery cut-outs from a wide range of countries including some Frank Stamps and meters in shoebox. 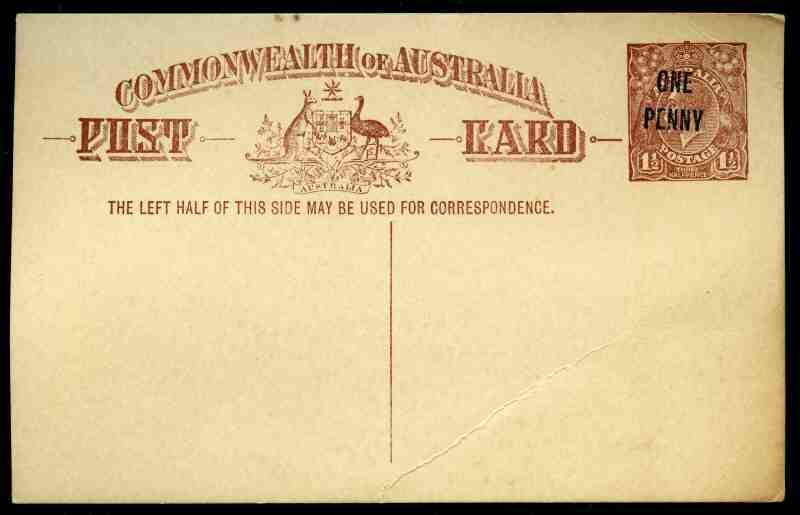 Useful range of Australian States and early Australian issues, including 114 mainly Victorian Frank Stamp cut-outs. Good variety with varying duplication.